Have you ever wanted to know the secrets of Beautiful Finishing? 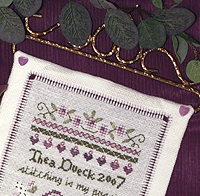 Learn Victoria Sampler's special finishing secrets using Thea's new "Stitching is my Passion" design! In this design there are delicious overdyed and silk threads, amethyst heart beads, and pearls. Victoria Sampler's Finishing Expert, Lisa Archer, will show you three different methods of finishing them. Our first method to finish a bellpull is called the “Fold Over” method. Our model is shown at upper left of cover photo. You can use this method for any design, no matter how big or small it is. Just be sure to adjust the measurements of the fabric and choose proportionately sized double bellpull hardware. The Fold Over method is simple and elegant, flexible yet firm, and hides the back of your stitching under your choice of backing fabric while adding that extra touch of perfection to your precious stitching. See how easy Beautiful Finishing really is! The second method of finishing bellpulls is with "Hemstitching". Perhaps this method is a bit more complicated, but if you carefully follow Lisa’s easy directions, you too can create an Heirloom like the model shown on the front cover at right. The withdrawing and re-weaving of the fabric threads takes a bit of care, but as soon as you’ve done this, the rest follows naturally. Use the step by step photos on the following pages, and see how Lisa shows you the easiest way! The third method to finish bellpulls is with a simple edging stitch called the "Blanket Stitch". It is shown on the front cover at the lower left. The Main Chart and the diagrams will help you with placement of the Blanket Stitches. Any bellpull can be finished this way, but it particularly lends itself to bellpulls that already include Hardanger as part of the design. All you do is edge around the outside with the Blanket Stitches, cut away the excess fabric, and attach the flap to a bellpull hardware as shown. Finishing has never been so easy!! 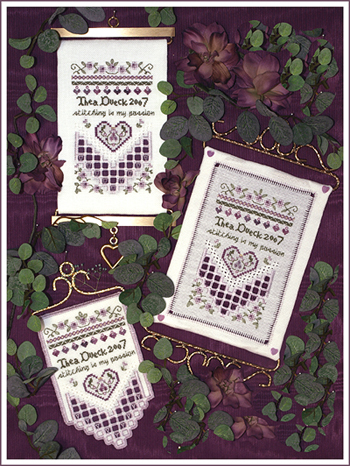 The lovely "Stitching is My Passion" design is one that lends itself to the three different methods of finishing, and you can choose which chart to follow according to the method of finishing you want to use. 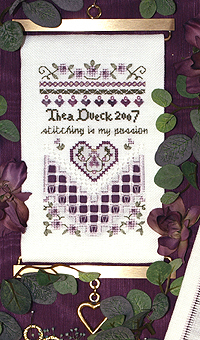 You will explore Basic Hardanger techniques like Kloster Blocks, Weaving, Modified Dove’s Eyes, and also more intermediate techniques like Four sided Pulled Stitches and some specialized Hemstitching to create a lovely border and casing for the Hemstitching Method of Finishing. You will also cover Diagonal Four-sided Stitches, Backstitching, Star Stitches, Petit Point Crosses over one, Large Cross and Upright Crosses, Bowtie Variation, Queen Stitches, and Lazy Daisies. ACCESSORY PACK: Ask for the Beautiful Finishing 1 - Bellpulls Accessory Pack at participating needlework shops. This pack contains plenty of threads and materials to complete at least ONE of the three samplers shown on the front cover!